Goodreads says, "Oct. 11th, 1943-A British spy plane crashes in Nazi-occupied France. Its pilot and passenger are best friends. One of the girls has a chance at survival. The other has lost the game before it's barely begun. When "Verity" is arrested by the Gestapo, she's sure she doesn't stand a chance. As a secret agent captured in enemy territory, she's living a spy's worst nightmare. Her Nazi interrogators give her a simple choice: reveal her mission or face a grisly execution. As she intricately weaves her confession, Verity uncovers her past, how she became friends with the pilot Maddie, and why she left Maddie in the wrecked fuselage of their plane. On each new scrap of paper, Verity battles for her life, confronting her views on courage, failure and her desperate hope to make it home. But will trading her secrets be enough to save her from the enemy? 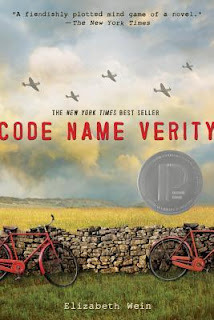 A Michael L. Printz Award Honor book that was called "a fiendishly-plotted mind game of a novel" in The New York Times, Code Name Verity is a visceral read of danger, resolve, and survival that shows just how far true friends will go to save each other." The year is 1943 and a British spy plane crashes into Nazi-occupied France with two passengers aboard. One is the pilot and the other is her best friend. One of the girls, Verity, is captured by the SS and in her cell she writes down everything she can about the British War Effort. This is all to avoid brutal torture. But what Verity writes is more than just inside information about the planes and codes, but rather a story in a sense. The story focuses on Maddie, the pilot of the plane, and she also includes information for us readers about her life in the cell. The SS officer has someone translate it everyday, but what will happen when Verity gets to the end of the story? Elizabeth Wein's honorary Printz novel is a powerful one about friendship, war, and the sacrifices made. At first, I wasn't sure where the Code Name Verity was going, but slowly all the pieces fit together and the picture became clear. When I first picked up Code Name Verity I knew that it was going to be a powerful and moving book based on what I've heard from everyone. I knew that it received many awards, so needless to say, I had high hopes. The first 100 pages left me feeling rather underwhelmed and questioning if there was an unreliable narrator in the novel? I had no idea where the story was going and I almost put it down. I am so glad I stuck with it, because it slowly came together and the ride was definitely worth it. The first half of Code Name Verity is narrated by Verity and the second half is from Maddie's perspective. Once Maddie took over, the story's pieces came together easily and I was on the edge of my seat hoping Maddie could help Verity escape. If you are looking for a smart, well-written novel that is slow to reveal itself, much like The Book Thief, then you should definitely check out Code Name Verity. It tugged on my heartstrings and these two best friends won't easily be forgotten by me. This novel would be a great addition to any school's World War II unit as there is much to discuss and it packs a powerful punch. Great review Christina! This is definitely a book that requires some patience and perseverance from the reader! I liked the companion novel Rose Under Fire too. Thanks, Christina! I agree...I am so glad I stuck with it though. I will have to check out the companion novel. Thanks for the suggestion and thanks for visiting! Wonderful review! I don't think this is my type of book, but I'm glad to see all the pieces came together for you. I had to see what all the hype was about since it seemed everyone loved this book. I'm glad I stuck with it. Thanks for visiting, Lefty! I don't think I got past Verity's narration before I gave up. Shame, really. I completely understand, Joy! I almost did the same thing, but I'm glad I stuck with it b/c it definitely got better. Thanks for visiting!